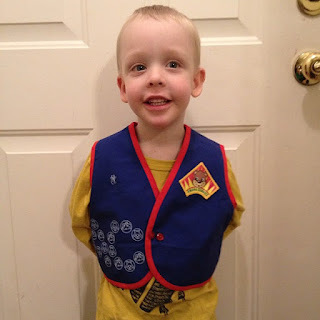 I posted a picture of Bubby on Facebook tonight wearing his new Awana Cubbies vest. I was proud to post it, but I was also a little sad. Posting it made me realize we are officially no longer going to the church we have attended almost our entire time in Missouri. About a month ago I wrote about a decision to leave. It still makes me cry thinking about that meeting. The people who need to know the details of why we are leaving know them. We aren't leaving out of anger or sneaking off because we have done something. I really wanted to be able to stay. My babies were dedicated here. The nursery workers know about G's issues. C LOVES his Sunday school teacher. I have some amazing, beautiful friends here. Our young adult community and its leadership is wonderful. The children's pastor is someone I call friend. And on and on I could write about why I did not want to leave. But for several months we have lacked peace about a couple of things. So we prayed. We consulted people further along in life than us for insight. The best advice I was given was, "Don't run away from something. Run to something." We waited. We talked to our dear pastors. We started looking. And in the process we believe we have found what we had in mind and yet what we didn't quite have in mind - but we have peace. There are more tears to shed, I am sure. There is more to share (and not share) about this whole journey, but for now I am just so thankful that God is with us. I am thankful that there are people I love where we used to attend, and I am thankful that I will be given new people to share life with at the new-to-us church. Ugh. It can be traumatic to switch churches. I hope you're able to maintain the relationships at your old church and simply experience a widening of your community. We left a church 4 years ago but still host one of its small groups and run around, almost exclusively, w/ people from there. It's very strange...but good. I love that you have shared here how you maintained relationships. We loved the community of young adults we have gotten to know in recent months, the pastor, the worship, etc. We have been reminded that we are always welcome back or to visit, etc., and I still plan on hanging out with the friends I have made there. It is strange. But it will be good. And God is bigger than all of the strange-ness. We faced a similar change a few years ago. It was especially hard to leave a place that had made room for my special child, where all of the people in his classes knew and understood how to include him. The great thing about the Church, the people following our Lord, is that the same place has been made for him in our new church family. There is love and acceptance waiting for you as well! Wishing you the best! This was so encouraging, Rachel. Thank you! The first night we visted our "new church," I was dropping G off to the nursery - and the workers were asking about his age so I could figure out which room to put him in. I was explaing he was two but not developmentally, and another mom was there and piped in, "I have a child like that." Just to be understood without explaining meant a lot. I am so glad you found peace! That is THE most important thing. So, hey, what about that coffee date? Thank you, Courtney. I appreciate your friendship. And yes to coffee. We are FINALLY all healthy around here, so I messaged you about working around Mike's crazy schedule. Let me know what might work best for you. That had to be an awfully hard time, tough decision. Church hunting makes my stomach hurt. I'm glad you have found a new home though!